With the progression of the TransLink/Clipper program to take over all paper media including passes, tickets, and transfers within the next couple of years, there will be some serious changes to the atmosphere of public transit. Muni is going to be one big target. The MTC mentions on page 25 of resolution #3866 (PDF document) that bus and metro transfers is tentatively scheduled to be eliminated by September 30, 2011 (as long as the SFMTA Board approves this transition date). After this date, the only form of free transfers would be only on the TransLink/Clipper card. This is similar to Washington D.C.'s rail and bus service where as of January 4, 2009, paper transfers are no longer issued, and an RFID fare card was required to do all transferring. For Muni, eliminating paper transfers means a huge cost savings on printing the thousands of transfers for every single day of the year, and will stop the litter at terminal stops where in some places, are just all over the ground and the trash can is just a few steps away. People who pay cash won't be issued a transfer or payment receipt. What do they show when demanded to provide proof? An empty wallet? I asked a similar question last April about what to do if Muni charged all passengers if they wanted a transfer. Without the paper transfers as proof to show the fare inspectors, this means the inspectors are much less useful to enforce the fare evasion laws/codes that governs the transit agency. A passenger can easily claim to the inspector that he/she paid in cash, when in reality, boarded the back door and didn't pay a cent. Fare inspectors would be only able to do one thing since they can't check for "proof" anymore, just write tickets for gate jumping and back door boarding. For the fare inspector force, get ready for some fat trimming. The amount of tickets they write doesn't make-up for their salaries (simple math shows each inspector only writes an average of $9,800 worth of tickets per year vs. a $50K+ salary), and by killing paper transfers, at least expect a pay cut (minimum). Fare inspectors, I suggest: You have one year and seven months to start looking for another job. 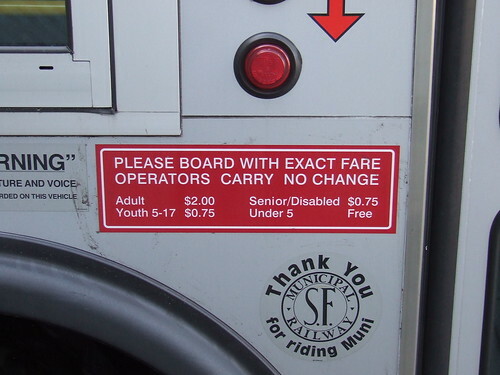 I'm sure Muni won't need your services anymore while their budget is hemorrhaging like crazy. The only way this would work is if you had more machines to dispense the cards, like you do in San Diego. You can buy anything (ticket, 3 day pass, etc) from any machine anytime. BTW, measuring the amount of tickets issued vs. the cost of a fare inspector isn't fair. Part of the value is that as more people get the message to pay or pay a fine, they pay. David Chiu really fucked up when he pushed that last year.